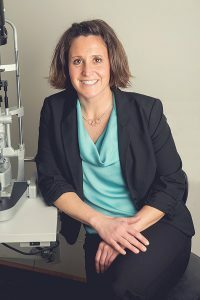 Dr. Sarah M. Escott is a specialist in uveitis with additional interest in general ophthalmology and cataract surgery. She received her medical degree from The Ohio State University in Columbus, Ohio. Following an internship at the National Naval Medical Center in Bethesda, Maryland, she served four years on active duty in the United States Navy as a flight surgeon. Dr. Escott went on to complete an Ophthalmology residency at The Ohio State University Havener Eye Institute followed by a clinical uveitis fellowship at Northwestern University in Chicago. Dr. Escott’s clinical interests include medical management of anterior, intermediate, and posterior uveitis as well as scleritis, including the use of immunosuppressive medications and performing cataract surgery.